"Equilibrium was the best show to date that JCB have ever done. A real crowd puller, a total show stopper!" "Equilibrium was, without a shadow of a doubt, the best attraction I have ever seen at Con Expo." Inspired by the success of JCB's last involvement with Lavish - when their highly versatile machines featured in our 'Dockside Story', at the British International Motorshow in 2007 (check out the case study) - JCB commissioned Lavish as Show Producer to create their own bespoke machine Spectacular, staged at the World's leading construction industry exposition, CONEXPO-CON/AGG in Las Vegas, March '08. 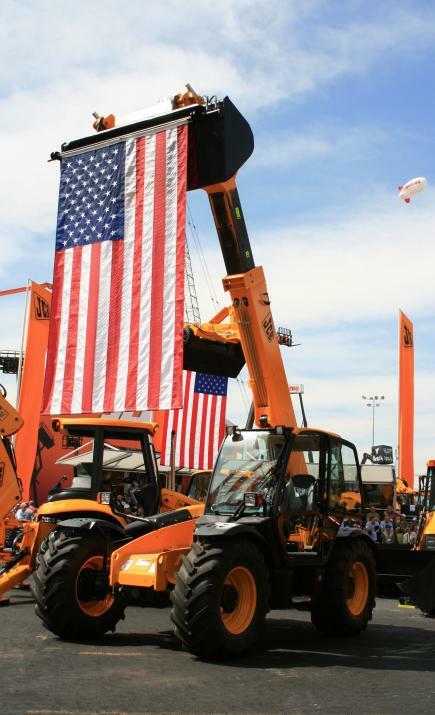 As a world leader in construction equipment, JCB wanted a pioneering Show that would help further establish their brand in the USA and concrete their reputation as a innovative and forward thinking company , a company who are always raising the bar, whilst still maintaining their unrivaled reputation for customer service. Inspired by the legendary Hollywood choreographer Busby Berkeley, Ami Jade Cadillac the Show Producer & Director, devised a unique and dynamic 'Machine Cirque' concept for JCB titled 'Equilibrium'. 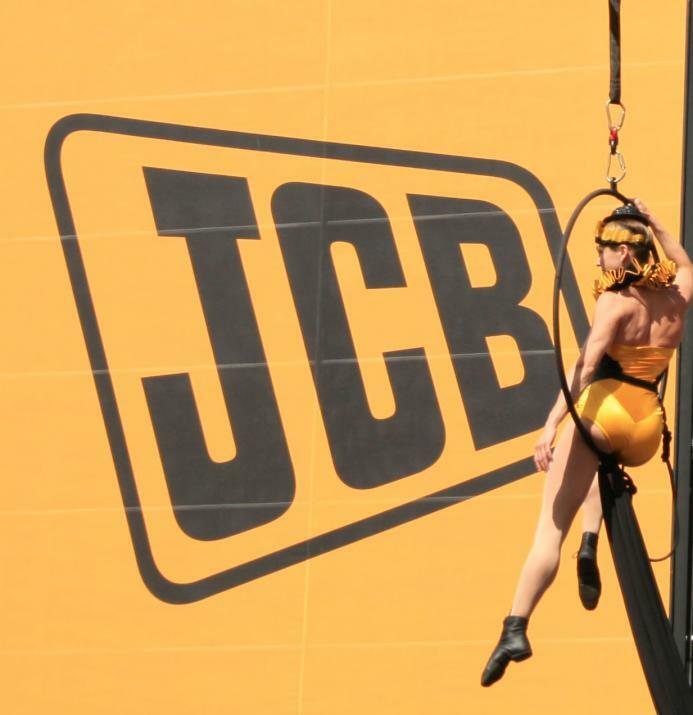 Performed five times a day, for five days straight; and staged in the round as a part of JCB's cutting edge stand, Equilibrium featured Ami's newly choreographed routine with the JCB "Dancing Diggers", which she had previously created with JCB at their headquarters in Rocester, UK. 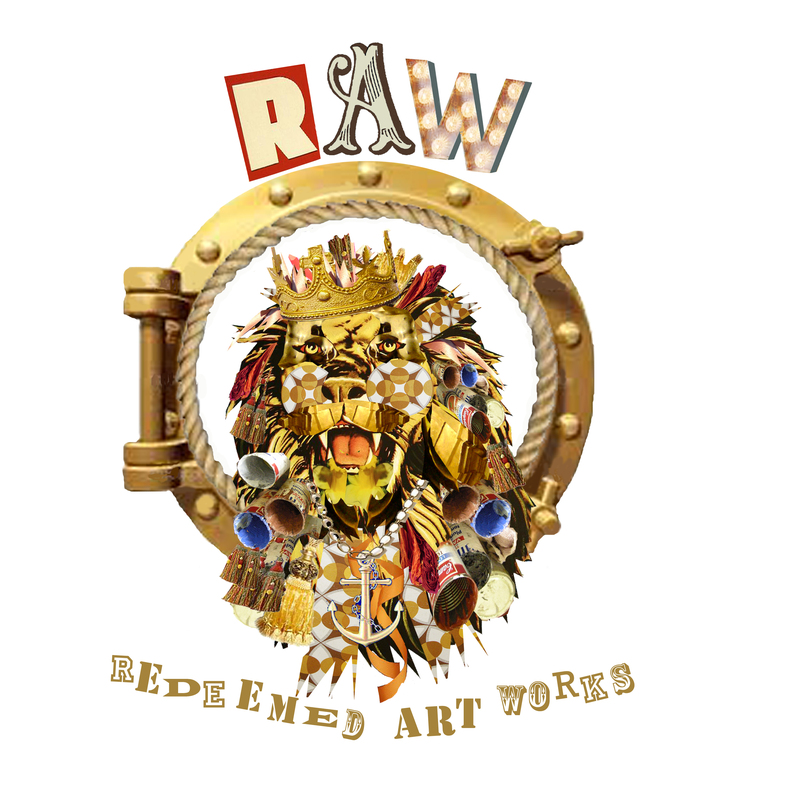 The Show created a kaleidoscopic visual feast that was as far from the static displays employed by other exhibitors, as the ipod is from a cassette player. 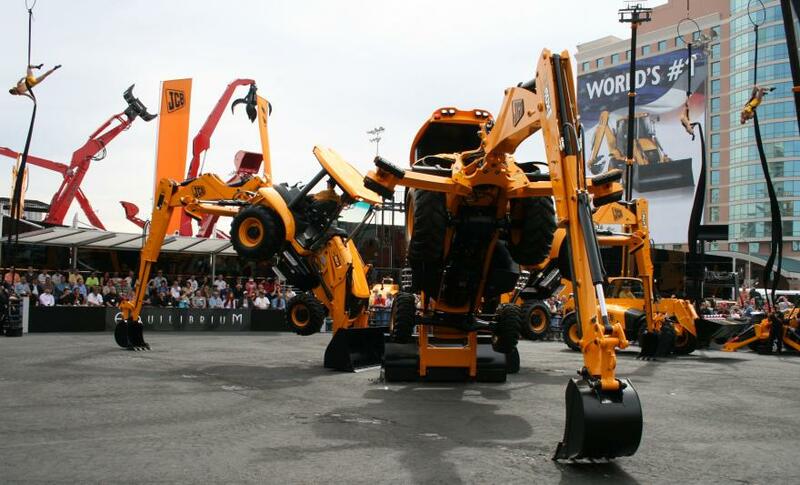 The "Dancing Diggers" performed amazing feats of engineering and wowed the 2,000 strong audiences attending each show as they defied gravity and demonstrated their immense strength and grace- and they weren't the only ones! The 9 Vegas aerial Showgirls who accompanied the machine ballet displayed a disregard for gravity that exceeded even that of the Diggers, as they swooped and spun some 40ft above the open mouths of their audiences. Entering the arena on the arms of the proud JCB Display Team drivers, in ruffs and gem-studded mini bowler hats, the girls proceeded to perform an elaborate fan dance choreographed by co-Show producer Esme Bianco, before being lifted into the air where they performed a beautiful hoop and silk routine - and all suspended from the arms of three JCB Loadalls! Choreographed by Juliette Hardy-Donaldson - the Showgirl's aerial routine artfully recreated the razzle-dazzle of Hollywood's Golden Age, and their dazzling 1930's inspired costumes were conceptualised by Esme, who worked closely with costumier Wendy Olver, to produced the beautifully finished costumes. Giles Thacker; whose work has become an iconic element of Lavish's shows, created an incredible graphic film which he artfully mixed with Live feed, which, coupled with the toe-tapping, show-stopping soundtrack produced by Mark Nicholls, meant that the overall impact of the show was able to combine and transcend the sum of its individual parts. 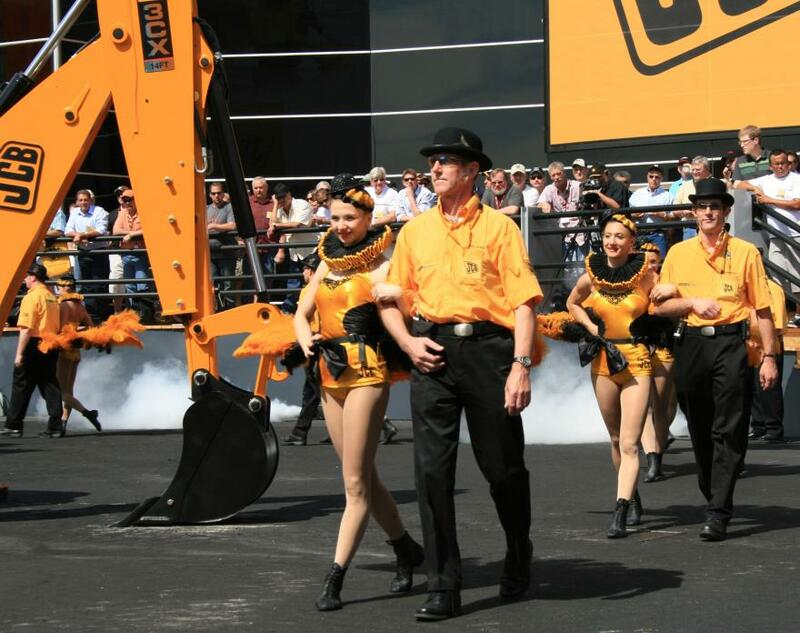 Attracting an audience of 2000 delegates, press, industry competitors and Sir Anthony Bamford himself (who reportedly described it as "the best show JCB have ever done") to the VIP press show, "Equilibrium" certainly swung the balance at ConExpo well and truly in JCB's favour.